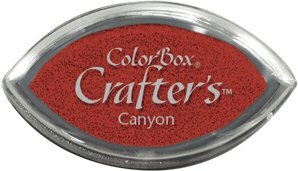 Clearsnap-ColorBox Crafter's Cat's Eye Ink Pad. A dramatic pigment ink in colors with a kick! It is permanent with heat set. Ideal for use on many surfaces including fabric, wood and clay. This package contains one 3/4x2x1 ink pad. Conforms to ASTM D4236 Comes in a variety of colors. Each sold separately. Made in USA.